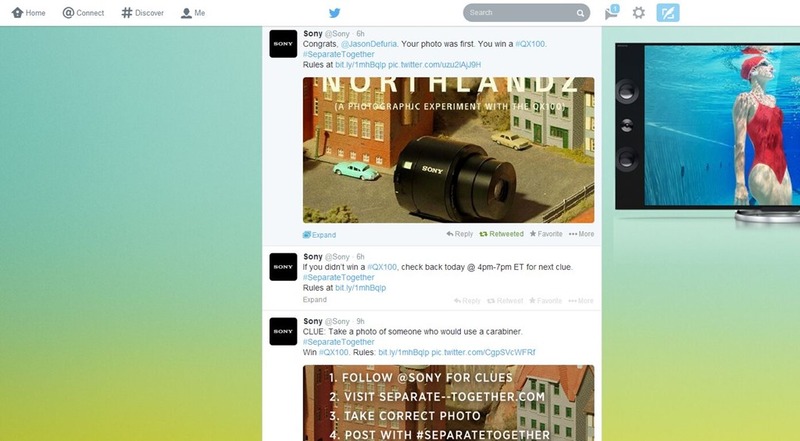 Today, I ended up entering a contest on Twitter- one in which a Sony Camera- the QX100, was being used as a giveaway for the @Sony Main Twitter Page. I’ve been working for ArtsPromo lately, an organization that runs the digital media accounts of various musical groups and artists. It’s interesting how I forgot how effective a product giveaway contest can promote a product so easily via social media. Let’s break down the perks. 1. It doesn’t matter how much you giveaway, as long as contestants understand the contest. This can be a good fact to remember for smaller businesses, as it is often harder to justify a giveaway of products if you can’t afford it. As long as those participating in the contest understand what it is they must do to qualify for an entry, then the giveaway will be deemed worthwhile. 2. It’s REALLY important to know the state and federal guidelines about giveaways. Sony has a third party corporation, Enteractive Solutions, overseeing the QX100 giveaway, which verifies eligibility and covers Sony from any legal complications. For smaller businesses, there are often easy to locate guidelines on your State Website. It’s really important to know what you can and can’t do for giveaways. 3. For smaller companies, think about contests that showcase the BEST response, not the quickest. If you’re a smaller company who needs a lot of exposure, think about a 30 day giveaway with either a blog component or something you can create the most buzz with- maybe someone who submits the content to the most media outlets would also be an interesting approach. You want to reward those who are helping to further your cause. Another interesting idea would be for YouTube submissions as entries. It’s really hard to administer an entry system yourself, and there are a ton of useful items to use for giveaways on Facebook and Twitter. Two that I’ve used are WooBox and Rafflecopter. Make sure you make extra entries available for people who are sharing your contest with their social networks- this encourages your promotion to become viral with the sharing aspect. 5. Make it simple, make it fun. The best contests seem to hit upon two facets- they’re easy, AND they’re fun. I’ve seen some very creative Facebook contests in the past, which include tagging friends in Facebook photos, creative reviews of a product, The Sony Model train picture finder (that I talked about briefly at the beginning), sharing for giftcards, surveys for entries into the contests, tracking contests with # (hashtag) entries, and so on. As long as it’s easy and something your brand can support, have fun with your contests to drive the social value and sharing on others’ social networks.